With top-performing carpet cleaners in the market today, users no longer have to endure draining kneel-and-scrub chores. Not all carpet cleaners are on the same level of effectiveness, however. There are numerous factors to consider before deciding on which option buy. This guide is here in order to be useful to you when you go shopping for the ideal carpet cleaner. Knowing what type of cleaning job you need to accomplish in your home can help a lot with your buying decision. After all, there are a number of factors that hold different carpet cleaners apart. While more generic cleaners do get the job done, specially engineered machines can help you go beyond basic sanitation. Getting the most out of a cleaner should be your top priority. A machine with premium, high quality features are cost-effective over a long period, and can significantly lengthen the durability of carpet fabric. Consider, as well, cleaners that offer multiple brushes and an adequate suction system for deep cleaning, along with an ability to provide heated air drying. Those with accessories that make cleaning a more convenient task should be on the top of your list too. Considering the behavioral habits of the people living in the same house as you might also be of help. There are cleaners specially designed for households with children and pets, for example. Also, keep in mind that while you can avail yourself of rental carpet cleaning services for quick jobs, owning your own machine can help you stay in line with your monthly household budget. Aside from all of that, examine your home’s carpet type and see what needs are the most apparent. 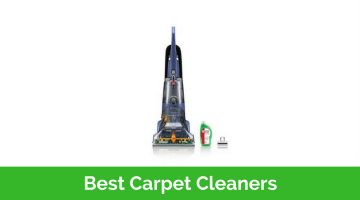 After that, take a quick look at this year’s rundown of the best, top-performing carpet cleaners and find excellent options. Capable of providing an impressive 75% more suction than the other leading models. Provided brushes are designed after the Dual Cross Action Brushes Technology which is used to sweep every side and angle of carpet fibers. You can use the Super Boost Spray function to customize your cleaning preference in all areas covered in all sorts of dirt and filth. Designed with carpet-friendly wheels to enable users to maneuver it more comfortably. Larger opening lids are added for easier filling and emptying, and a soap measure cap that allows you to accurately use solutions. The 12-inch wide nozzle immediately leaves satisfyingly clean paths for you. Rated as the best carpet cleaner by the Carpet and Rug Institute, this machine really lives up to its name. Trusted by a lot of satisfied customers, this deep cleaner snuffs out the others when it comes to convenience, maneuverability, quality, durability and performance. While it does an exceptional job on carpet and upholstery, it also aims to preserve their quality. The little details for the tools are also brilliant add-ons. The handle is highly sufficient as a compact storage, and it never gets in the way when you are using the machine. 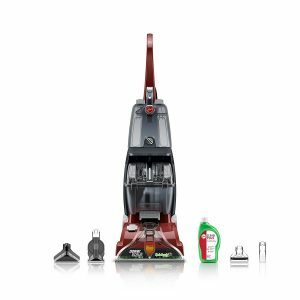 The Super Boost mode is more than satisfactory – it helps you clean different carpet areas depending on their need, with just a simple knob turn. Consistent and designed mainly to last longer than the others, this machine is the most worthy unit anyone can and should invest in. Remarkably capable of pulling back all the residual solution from the carpet, allowing it to dry faster than you expect. The roller brush might just be the most exceptional aspect as it helps prepare the carpet more effectively and it complements the suction system. You can use other detergent or solution detergents from other brands – the machine will perform the same way. The times you will have to clean your carpets will be largely reduced. It is also light to use. The tanks are smaller than the usual, which may require you to repeat filling and emptying. On the other hand, there are lesser chances of them leaking. The area positioned at the front where suction generally takes place cannot be taken apart for cleaning. However, the contents can be reached with a ruler or a thin rod. There are no wraps for the cord and other tools, which compromises their durability during heavy use. You can resort to buying extra accessories to keep them well-maintained. Other than its overall genius design and well-engineered features, there is one simple reason why you should start investing in it – it is the best in the market. Having surprised even the most experienced people in the carpet cleaning industry, this machine is considered to be highly instrumental in preserving not just carpets, but homes. The price may be expensive for some, but investing in it is loads more cost-effective when you look at it from a zoomed out perspective. After all, you have 5 years of warranty to enjoy, so why not get the best? Takes a huge chunk off of your cleaning time with its ability to clean on the forward and backward pass. Deep-down dirt can easily be terminated with the rotating dirt lifter and their power brushes. Instantly comes with Bissell’s 2X Professional Deep Cleaning Formula for all types of messy, tough stains. Has larger capacity for the dirty water tanks, which instantly means lesser chances of repetitive filling and emptying. Capable of cleaning hard-reach areas by providing the stain tool for use. 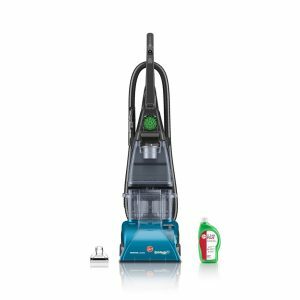 If you thought deep cleaning couldn’t get any more flexible, this power machine is here to prove you wrong. Engineered with professionally graded cleaning elements and a design to die for, this power cleaner goes beyond most carpet cleaning tools. Its cleaning formula possesses high-end chemicals that focus on getting ground dirt which potentially harms your carpet’s fiber. Along with consistent performance, ease of use, and amazing durability packed into one unit, stain removal tools are also provided for added convenience. The more powerful motors do a more effective job at getting the entire gunk from the floor. Worried about the type of rug, carpet or upholstery you own? Fret not! This cleaner works superbly well with anything. Durability is undeniably one of its strong points, as seen through the adjustable tank handle. Considered as an ergonomic dream, the tank handle easily allows you to select the height of cleaning that it best suited for you. The 9-foot hose and 6-inch stair tool are also added instruments for convenient cleaning. Machine warranty is now extended up to 5 years, so investing in it is definitely worth the price. Carpets also dry twice as fast, which is enabled by its dirt and liquid extractor. Although cleaning time is significantly shorter, the machine is heavy so it may easily tire you out. It is great as a physical workout though. There is a recurring flow spinner issue, which is primarily caused by its design. You can send it back for quick replacements within the warranty period. This cleaner is considered by some as capable enough to visually erase years’ worth of dirty and heavy foot traffic. Basically, it is a one-pass machine which keeps the carpet fibers from degrading too fast. It can also help you reach baseboards which are naturally harder to clean. The tanks are also equally matched, letting you know when the dirty tank gets full at the exact time the other tank empties out. Talk about highly convenient and speedy cleaning! Expect impressive carpet makeovers with the Dual Dirt Lifter Power Brushes alongside the Heatwave Technology. Provides extra tools for more convenient cleaning tasks – the pet stain tool, tough stain tool, and an 8-oz bottle of Deep Clean + Antibacterial Formula which eliminates odor-causing germs. Tank capacity is leveraged to one full gallon to save up time. 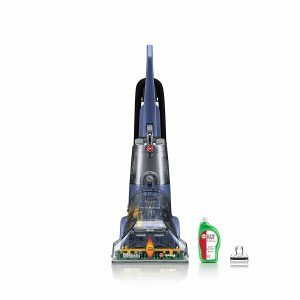 Offers users two interchangeable modes – Deep Clean Mode for thorough jobs, and Express Clean Mode for quicker fixes. With this monster cleaner, you can stay on top of all sorts of stains as it is specially engineered to tackle just about anything. The 12 rows of dual power brushes at the bottom end are a gift to all carpet types. It is also easy to put together, so you won’t have to worry about spending more time on setting it up than actually getting to the cleaning stuff. For antibacterial cleaning, you will only have to fill the tank to the water line, pour in the solution, and then fill hot water to the next line. There is a switch you can use to alternate the provided modes, but for better carpet coverage, use the Deep Clean mode. This machine also works with other detergents and cleaning solutions not just from Bissell, although you can sparingly use the samples that are automatically included. The quicker cleaning mode allows carpets and upholstery to dry after an hour. It substantially collects mild debris from the fabric, and it is the perfect choice for rush fixes. The power brushes do a great job at pulling the hairs out from the carpet, even after prior vacuuming. It is fairly light to use, half the size of usual rental units, and not as loud as the common ones. All the solution samples for pet or tough stain removal leave carpets and furniture smelling like they are new. The clean, fresh scent also lasts longer. Carpets may take a while to dry off if you use the Deep Clean mode. The process can be sped up if you vacuum the place after 2 to 3 hours. The brushes that usually spin at full speed during the whole length of cleaning highly expose the cord to being possibly run over. This can be prevented or remedied with the help of an electrical tape used to cover the cord as an outer insulation protection. Has the normal tendency to clog up overtime. Make sure you vacuum the area first, and check the screens and the brushes. Plenty of deep cleaners from the market actually do a great job on cleaning. Buying this one however, makes you feel like you own one of the power units from the rental store. The modes undoubtedly provide you with more flexibility when it comes to cleaning. Its low-foot profile also makes the cleaning less tiresome. Possessing it basically means possessing a superpower. Offers a self-cleaning hose which removes dirt and bacteria by itself after every use. Combines powerful suction with remarkable stain removal by its cleaning solution formulas. Comes in directly with an 8-oz. bottle expert cleaning detergent, a 4-oz. pre-treat gel, and a multipurpose tool designed with antimicrobial materials. Includes a 14-ft. power cord which enables users to remove stains and filth in hard-reach areas. This machine brings deep cleaning to a whole new level. With its impressive self-cleaning properties, anyone can undoubtedly enjoy the lesser time it takes to clean the parts. Unforgiving on the stains, this machine can work well with just about any type of surface. The powerful integration of suction and dirt-locked detergent solutions can help maintain the freshness of padded furniture, upholstery, and all types of carpets. The spotless cleaning system also makes it a longer-lasting candidate for all your cleaning fix needs – its primary ability to prevent bacteria, mildew and mold from growing within already acts as a self-preserving agent. That basically means you might just be getting more service than you actually expect. It has deep cleaning rubber nubs that are easy to clean, along with two separate tanks that are lightweight. The power cord can be used for outdoor cleaning (auto-interiors or hard-reach hallways). The automatic shutoff prevents possible the tanks from overfilling. The filler cap is awkwardly small, which makes it a little more challenging to unscrew. Solution tank has the tendency to leak out of the unit. This can be avoided by double-checking if all the attachments are securely fit together. The powerful suction may be bad for softer fabric types in the long run. Use it on them sparingly to avoid unnecessary runs and damages. Not too ideal for hard floor cleaning. Aside from the mentioned features, the extra tools that come with the machine may be of great use to you as well. There is definitely lesser overspray since the angle of the sprayer is narrower. It is also loads quieter than previous models in the market, and is loads more light and easy to maneuver, which makes it easy to entrust to children and caretakers. Basically, this machine is optimally designed as a carpet and upholstery saver from messy pets and children. Everything else is also detachable, which largely allows the unit to dry out. Its Clean Surge Control enables fingertip control for releasing extra detergent to tough stains. The 3-Speed Brushroll Control offers flexible cleaning modes – low for gentle cleaning, high for normal, and off for picking up liquid spills. 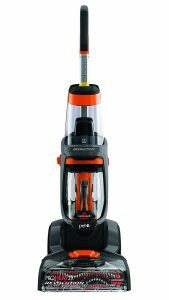 Generally relies on its powerful 12-amp motor to perform optimal floor clean-ups. Loosens up areas of accumulation through its scrubbing system. 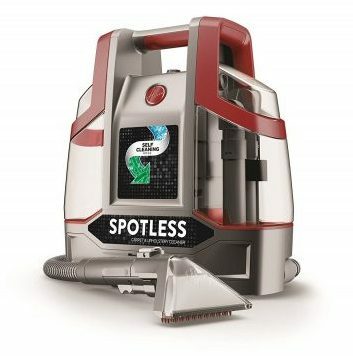 Primarily capable of lifting dirt and grime from all carpet fiber sides, this machine can perform deep cleans whenever you want to. 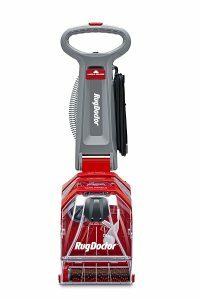 With no belts vulnerable to injury or constant replacement and an 8-feet stretch hose that can be used for extended reach, this model is quite the power cleaning tool. What’s even better is you can shift easily between the cleaning modes. It also is highly capable of speeding up the drying process after a thorough clean. This largely helps anyone who needs the carpet done for rushed room makeovers or having guests arrive unexpectedly. Works well on inlaid vinyl and tile and any upholstered furniture. Thorough cleaning is mainly facilitated by the machine’s continuous suction. The half-gallon capacity of the tanks substantially lessens fill-and-empty tasks. Certain carpet types may need to be meticulously prepared before you can use this machine on them. Tank cleaning is also a bit time-consuming and complex to do. Units have the tendency to leak if they are not properly secured. Has the tendency to fail at picking up water, so the bottom compartment has to be secured as well. The warm water that gets blown out at the bottom end of the machine helps hasten drying. If you decide to make this purchase, you will enjoy the Clean Surge feature, which adds an extra cleaning solution burst for monster stains. The solution also comes in with a new fresh linen scent, so your home can smell new all of the time. Crevices, cracks and narrow spaces can be conveniently tapped by the 22-inch power cord. Tough stains and odors on all types of surfaces can be rinsed away by the Professional Spot Cleaner solution that it comes with. The 5-flex hose adds more cleaning pressure on stairs, auto interiors, and area rugs. Provides professional-grade cleaning solution which also contains Scotchgard protection to prevent carpets from getting stained. This machine, aside from being heaps more portable and more merciless on tough spots, requires no assembly. Tools are also provided to help you prepare the areas you plan to clean, such as the 6-inch stair tool, and the Bissell rug cleaner. Considered as Bissell’s largest capacity machine, you can empty and fill the tanks less frequently. Speed drying is also one of the machine’s main focuses, as the suction system is more powerful, making it a power tool for quicker cleaning jobs. Emergencies for home improvement can then be something you can worry about a lot lesser. Machine’s recovery tank is less cumbersome to clean, as its whole lid comes off. It also doesn’t have nooks where filth and gunk usually hide in. Expect fewer trips to the bathroom! Larger tank storage helps you cover more areas on the floor without breaks for constant filling and emptying. Power cord can be used conveniently for padded floors outside the house. For small-framed individuals, this 17-pound machine can be quite heavy to lug around. Carpet shampoo has the tendency to attract dirt, but this can be prevented by using half the recommended shampoo concentration. There is an apparent flaw to the hose design. The handheld brush causes it to kink in, further leading to cracking. This can be remedied by not placing the brush in its holder. Equipped with highly useful tools, you can make use of other cleaning measures if you don’t feel like using the machine itself. Its ability to adapt to any surface without necessarily exposing them to wearing off is also quite convenient no matter what type of cleaning fix you need. It also doesn’t require you to stick with the brand’s formula cleaners. The Dual Tank System allows anyone to clean carpets or other fabric types with water and soap solution and remove residue with one easy flip of a switch. More effective cleaning is made possible by the Automatic Detergent Mixing System which provides more accurate solution mixtures. 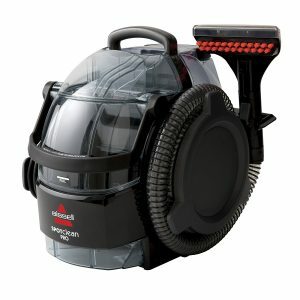 Capable of cleaning all sides to furniture, upholstery and carpets with its scrubbing technology. Comes instantly with upholstery and crevice tools; also provides a 16-oz solution bottle and a handy mesh tool storage bag. Offers two types of plain nozzles for quick alternate use. Capable of extending a fabric’s resilience levels against constant exposure to dirt and clean-ups, this machine still provides long-lasting results through its deep clean system. A little gentler than the previous model, users can expect more efficient cleaning tasks with the variety of extra tools. The one-hand power scrubber can be used to loosen up filth on a specific area on the carpet, preparing it for quick cleaning. On the other hand, the one crack and crevice tool instrumentally completes the machine’s design purpose, which is to provide very thorough cleaning. The whole package comes in with a solution you can use for a longer time as well. The brush assembly can be disassembled quickly, making machine clean-ups less of a chore. Suctioned hairs can also be removed as the parts for extraction are readily accessible. Significantly more effective at picking up excess water which speeds up drying. Debris getting into the metal screens where the brushes are positioned can clog suction. Periodic cleaning is therefore advised. Gear box is vulnerable to water and detergent seeping in, causing brushes to stop rotating. Future stuck ups can be prevented with a PB blaster used for gear cleaning. May cause rippling on wool and carpets made from natural fiber if used more than necessary. If you are looking for thorough cleanups on a much easier setup, this machine should do the job for you. Every part of the machine falls easily in place, and you only have to double check if they are secured before you let them do the magic. To get the results you expect, try vacuuming the area you want to clean. Simply follow the instructions to watch as years’ worth of filth get sucked up in no time! Offers a heated cleaning system designed for optimal drying – the powerful motors force out heated air instead of post-cleaning vacuuming. Provides two separate tanks to hold dirty and clean water for easy filling, emptying and rinsing. Special 350-degree cleaning capacity to break down harder filth accumulation in both upholstery and carpet fibers. Nozzle technology designed after Dual V which helps with sucking up dirty water. Its pressurized edge-to-edge cleaning helps get rid of stubborn stains in hard-reach areas. This model works as a quick power cleaner for a variety of surfaces. Engineered for thorough cleaning of carpets, rugs, and couches, anyone can enlist its help for accidental coffee overspills, or long overdue home makeovers. Fairly lightweight and easy to use, its portability and simple design can make you trust it with your children or your house’s caretaker. It also comes with two optional cleaning solutions you can use to remove odors from carpets. Debris accumulated in places the power brush can’t always get to can be easily picked up by the added upholstery tool. Relying on the general SprinScub 60 technology, dirt should be eliminated at every angle possible as well. Using it is basically treating your floor to a deep clean massage. Machine cleanup can be easily facilitated as the two tanks can be taken apart easily. Smooth shifting between water-only and cleaning liquid is made possible by the fresh water tank’s switch. Mainly uses steam for stain extraction, which is perfect for homeowners with pets. Also capable of cleaning rugs placed over hardwood or tiles. Water system has a tendency to leak out at the back where the rubber plug is placed, but can be easily remedied by using epoxy for plastic. Not enough pressure from the brushes makes cleaning of ceramic floors difficult. May pick up fuzz from carpet, which can possibly lead to clogging of suction area, therefore screens have to be thoroughly cleaned time after time. If you are basically looking for the cheapest yet sufficiently capable machine for thorough or quick carpet cleaning, then this model should work for you. It is light to maneuver and simple enough to enable you to keep up its maintenance. Take note that all these deep cleaners are rated as the best 8 products in the market. There are a number of factors that naturally intervene with shopping, but once you know what type of cleaning fix you really need for your home, you will learn how to make a more befitting decision. The best way to enjoy a cleaner from any of the products described above is to gather all the resources you can get your hands on to make cleaning a more enjoyable task for you. Take good consideration of your budget as well. If you live in an apartment by yourself or with a partner, you don’t necessarily have to purchase the more expensive ones. If you live in a much bigger house, getting more long-lasting results should be one of your top considerations. If you happen to be maintaining a much larger abode filled with kids and children, saving up for the ideal or perhaps the best machine might just help you in more ways than one. Best of luck in your search for the best carpet cleaner!